Anne Thompson was born in Bilston on 23 Feb 1801. Her parents were Isaac Thompson, a Japanner, and his wife Sarah (nee Astley). She married Edward Bagnall Dimmack at the age of 30 on 17 Oct 1831 – and was about seven years older than him. They only had one daughter who lived into adulthood, Frances Anne Dimmack. Edward Bagnall Dimmack, an iron master, had a co-partner called John Thompson in the 1830’s. It is assumed that this is Anne’s brother and is the main basis of the supposition about Anne’s parents. In the 1851 census Caroline Thompson is listed as a member of the Dimmack household as a niece. This would be the eldest daughter of John and Anne’s brother, Joshua, who was the Inn Keeper of the Green Dragon in nearby Darlaston. John Thompson, the business partner is listed in the 1851 census as an Ironmaster and coincidentally is living in Barnhurst. The property would appear to be part of the old Hellier estate and listed in his household is a governess, Sarah Amelia Agard. Sarah Amelia Agard from Manchester was to marry Thomas Evans. So there is a connection between the Evans and Dimmack families, at this early stage. John Thompson’s wife also came from Manchester, where his eldest children were born – including Astley Thompson. The name Astley allows us to clearly identify Anne Thompson’s mother as Sarah Astley, who marries Isaac Thompson in St Peter’s Collegiate Church, Wolverhampton on 25 Apr 1795. Anne Dimmack lived to the age of 80 and survived her daughter who died in 1862 and her husband, who died in 1875. She spent the last six years of her life at the Birches, Codsall – the home of Henry Marten and his family. She died in December 1881. The picture shown here is only probably of the widow Anne Dimmack. It is from the collection of her granddaughter Florence Marten, with whom her grandmother would have lived. This photo is ambiguously described as “gt grandmother Martin – the beret” (sic) in the hand of Molly Downing. 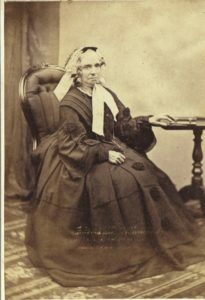 It is therefore possible that it is instead a photo of Eliza Marten (nee Warmington) who similarly shared a roof with the Marten family but who died in 1865. Because of the dates and the age of the photo it is on balance more likely to have been taken in the late 1870’s. 2 “Oxford Street Congregationalist Church Baptism Records”.